This is a temporary page until I have time to put together a real page for the Lamprey River Band. For now I just want something that points our our existence and a schedule of our dances. ‣Written directions and Google Map available. 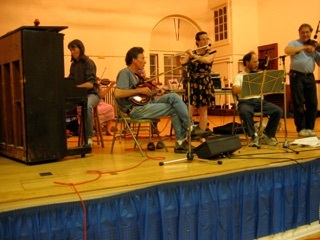 Who we are: We are a traditional New England contradance band based in the Seacoast area of New Hampshire. The current members are Peter Yarensky (that’s me), hammered dulcimer & caller; Sarah Mason, pennywhistle & caller; Burt Feintuch, fiddle; Steve Panish, fiddle; and Sarah Hydorn, flute & pennywhistle. We don’t have an official piano player right now, but generally Bill Zecker (who used to be in the band) is our regular unofficial piano player. What We do: We play for contradances in town halls and grange halls around the Seacoast area of New Hampshire and southern Maine and surrounding areas, and for private parties and weddings involving dancing (including square dancing and easy dances for people who have never done this sort of dancing before) in the area. We provide fun music and a memorable experience that are often the highlights of events of this sort - the part that people will remember fondly years later! 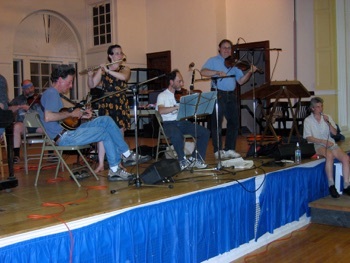 Dover Dance: Our regular dance is the Dover dance which occurs in the Dover City Hall (288 Central Avenue, Dover, NH 03820) on the first Thursday of every month from 8:00 to 10:40. Guest musicians and callers are invited to join us at this dance. ✤Important Note for Guest Callers: We have slots for three guest callers in an evening. Any more than that and the band callers don’t get our turn at calling! If you want to call a dance, please talk to either Sarah or me before the break, preferably near the beginning of the dance. The longer you wait the harder it is to fit you in! If we don’t know your calling, please let us know what you’re planning on calling. The Dover dance has historically been a more traditional sort of dance at which we can call the old Chestnut dances like Hulls Victory, Chorus Jig or Money Musk, or a variety of singing square dances, and most of the dancers enjoy those dances. We call some modern dances as well, and the guest callers are likely to call more of the modern dances as well as some of the chestnuts. For more contact information go to the Contact Information page. Eventually I hope to fill out this page with some history of the band, a separate page for the Dover dance, and other interesting stuff related to the band. ★Dover City Hall: 1st Thursdays, 8:00-10:30. Peter Yarensky, Sarah Mason, Lamprey River Band; guest musicians & callers welcome. 2014 Dover Dances: 8/7, 9/4, 10/2, 11/6, 12/4. Main pages of sections are listed here; look below for a complete site map page.